In this game you are the test subject of a new Pokemon TV shows that you can watch any time. 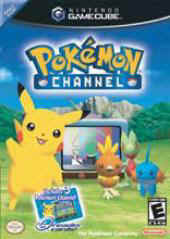 Also you meet up with a Pikachu who likes the TV and you and Pikachu become friends (Like in Hey You Pikachu). In this game also you can explore different places with Pikachu (All the different places in this game are some of the places from Hey You Pikachu) and you can talk and answer questions from different Pokemon.